An industrial overhead crane, or bridge crane, is a piece of equipment mainly used for material handling and heavy lifting. This type of crane system offers a safe and effective means of moving materials across the shop, while also offering the versatility and adaptability needed in an industrial environment. At CraneWerks, we offer a range of overhead crane systems. This type of crane is commonly used in an environment such as manufacturing as well as in maintenance jobs where time and efficiency are priorities. This type of crane is recommended for use in where there are low headroom issues that require more space than other shops. Industrial cranes are typically used to handle raw materials, steel, as well as other heavy components that are used in the steel refinement process or for handling large parts in the automotive industry. An overhead crane system is comprised of three major components, including a bridge crane that runs across the runway, a hoist and trolley that traverses across the bridge while also lifting up and down, and a runway that is attached to the bridge structure. 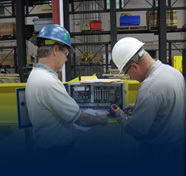 Our overhead cranes are built to sustain a variety of work environments. They are designed to be used for a large range of lifting and hoisting applications and can carry heavier loads to increase productivity. Overhead cranes also do not require you to clear pathways because the crane can easily maneuver around obstructions. They also offer versatility with the ability to accommodate various below the hook accessories such as spreader bars and can be purchased in manual operation reducing energy costs. In addition to the ease of use, an overhead crane can be rigged and controlled by the operator from a safe distance, reducing the risk of workplace accidents in the event that the lift would fail. An industrial overhead crane can be manufactured and customized to fit a variety of shops and applications. We currently carry top running single and double girder cranes, in manual or motor driven. Our single girder motor driven cranes are great for mold handling and metal storage, while our double girder cranes handle paper rolls and forge operations with ease.